Earlier this year, I was in an anthology entitled WOOL Gathering. I am lucky enough to be in a writer’s group called LOOW. We have all published stories set in Hugh Howey’s WOOL Universe and have stayed connected even as most of us have moved on to writing our own brand of fiction. WOOL Gathering served as a nice collection of short stories set in (and around) the silos and all the proceeds went towards the NaNoWriMo Young Writer’s Program. We wanted to keep writing together, so we planned another anthology — this time with the theme of superpowers, which will be called The Powers That Be. There are nine fantastic stories inside with most of the same authors who wrote for our first collection and a few new faces as well. On the right is the cover, designed by LOOW member David Adams. In addition to a great line-up of stories, Ernie Lindsey (author of the amazing book Super) agreed to write the foreword. 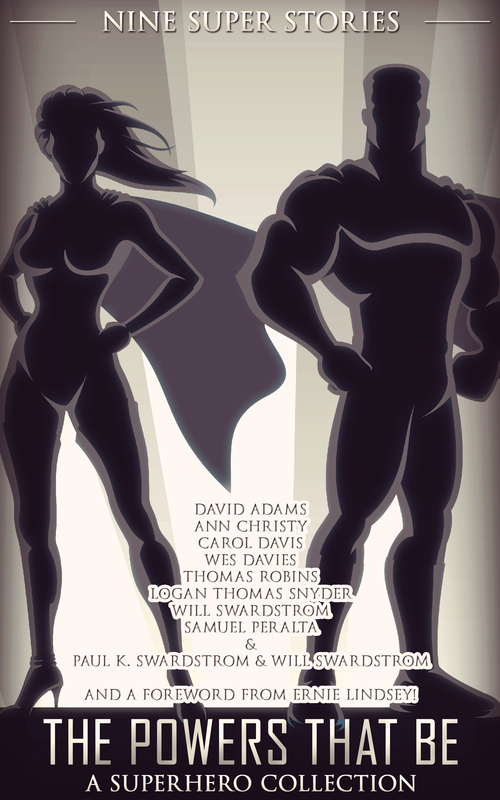 If you like stories about superheroes and those gifted with powers, this is the collection for you. But, by far the best thing about this book is where the money is going. Just like with WOOL Gathering, we’ve agreed to send the proceeds to someplace else besides our pockets. After recently adopting our son, my wife and I have spent more than enough time at the hospital to see what amazing work the doctors, nurses, and support staff do on a daily basis. Even more than that, the children who visit the or even live at the hospital are heroes in my book for their courage and will to fight on. With that in mind, we’ve agreed to donate the proceeds to Riley Hospital for Children in Indianapolis, Indiana, specifically the Sickle Cell Clinic to help the patients and families cope and live with this disease. The book is currently out for formatting, but once it is back from that, we should have a release date soon. I’m really excited for people to read this book and for the hospital to see some much needed money to help people cope with Sickle Cell Anemia. Anyway, back to the email. Lyn had read my short story Contact Window. He told me later that when he’d read it, he put it down, but couldn’t stop thinking about it and the possibilities of the universe. he ended up writing a story set in my universe, which he called The Return. It’s a quasi-sequel to CW; I might write a true sequel for the characters of CW someday, but he took it in a totally different direction. In fact, the direction he took it in was a total surprise and a total treat. I hadn’t expected the story to begin with and I never would have expected the way he took it. I ended up adding a little at the beginning and a little rewrite in the middle, but most of the story is his. And it’s a wonderful little tale it is. It shares the same universe and the same little nod of humor that the original story includes as well. To celebrate the release of the new story, and to give an introduction to the Contact Window Universe, I’m making CW FREE Monday and Tuesday. Pick it up and then get The Return for just 99 cents. Read both and leave me and Lyn a review of our stories. And let me know if the universe of Contact Window is one that is worth exploring in future stories. After I finish my next novel, my writing slate is fairly clear and CW might make a return appearance. This morning I emailed off a short story entitled Uncle Allen, its blurb, an Author’s Note, and a signed contract for an upcoming anthology. It’s inclusion in the anthology isn’t exactly secret, but I’m still holding off on saying I will actually be in it until the producer and editor read and approve my story. I’m playing with the big boys (and girls) here and I am scared to death I’m going to screw it up. Seriously…looking at the list of authors in this book and then my name somehow on this list makes me think I won some cosmic lottery. The sales and reviews these guys (and gals) have is ridiculous compared to the measly handful of sales and reviews on my books and stories. There is no way I deserve to be in this book, but I’m not running away from this opportunity. Whew. She at least remembers my name. “We?” Rachel asked, hoisting her suitcase out of the backseat. That stopped Rachel. She knew she’d been all alone on the gravel road coming into the farm. While the road continued past the driveway, it was rarely used, and Rachel hadn’t seen any dust from the road when she arrived. But she had been distracted listening to the music on her phone. Perhaps she simply wasn’t looking for a car and missed it. “Hmm…now that you ask me, I can’t quite remember. I’m sure they were here for your Uncle Allen, though. They always have been,” Naomi said, putting her watering can down next to a row of marigolds. She bent down — an amazing feat considering her advanced age — to pluck a few dead flower heads off the plants. Rachel, though, was still concerned about the visitors to the farm prior to her arrival. And there it was. Her grandma was combining fact, fiction, and history together. While Rachel had been recognized and greeted on the way in, suddenly Naomi was somewhere in her own past, and was apparently reliving some political thriller at the same time.